Coyotes, also known as prairie wolves, howl for a variety of reasons. Howling is a natural communication behavior displayed by coyotes. Basic howling is used for several reasons, including alerting other prairie wolves in the area of their presence. Coyotes inhabit most areas of North America and can be found from Alaska to Central America, frequently inhabiting arctic regions, mountains, forests and grasslands. The moon provides light and allows coyotes to see in dense, dark forests, provoking nightly activity such as hunting in groups. 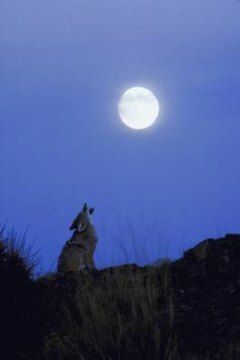 Coyotes are not necessarily howling at the moon, but the moonlight does lead to behaviors that cause the coyotes to communicate verbally to each other by howling. It's common for coyotes to howl in groups or when they're separated from each other. Ambient light conditions such as moonlight allow coyotes to see their home territory during the night, causing a defending coyote pack to vocally defend and alert intruders of their presence by howling. Coyote packs do not allow coyotes that are not part of their pack to enter their range. Territory and range depends on food sources and availability; when other coyotes approach a rival pack's territory, the home pack will defend its turf with howls, whines and barks to alert the intruders that they're not welcome. Coyotes work together as a team when they hunt, at times separating from each other to corner or seclude the prey. The kill is a team effort and the meal is shared by the entire coyote pack. During the hunting process, howling is used to alert each other of their positions. Even the minimal light provided by the moon will send coyotes out on a hunt, because it's easier for them to surprise their prey in the dark than it is during the brightness of day. Predators of coyotes also can see in the moonlight. When coyote cubs are present, their scent and cries can attract predators to the burrow or den where the coyote pack lives. To protect the young, coyote packs will quickly separate, running in various directions away from the den and howling, distracting the predator and causing confusion. The hopeful result is that the predator will hunt in the direction of the howling instead of the direction of the young coyotes. Once the predator is far away from the den, the coyote pack will stop howling and return to guard the young coyotes while the distracted predator searches the forest for other prey. If the predator returns, the process will begin again. Penn State News: Why Do Coyotes Howl? Animal Planet: Do Coyotes and Badgers Work Together to Find Food?